If you look at the page about my routine on the top of the website, you’ll see that my routine back before I started testing lots of products contained the Missha First Treatment Essence. One of the things that made that product popular (other than the ferments, of course) was that it contained licorice extract. Well, Missha reformulated the FTE, and suddenly there was no licorice to be found. So folks started looking for a substitute product. I haven’t yet found one that is a toner, but I heard a recommendation for the Nature Republic First Ampoule Essence. I was in the middle of testing some other things so I couldn’t bust it out right away, and then I wanted to calm my face back to normal before I jumped into a new skincare ingredient, so it took me a while to get around to this. I actually stopped using the reformulated Missha FTE at the same time, too, so it was the perfect opportunity to see a) whether my skin was as happy with ferments other than galactomyces and b) whether the First Ampoule Essence made as big a difference in the brightness of my skin as the FTE. Two birds, one stone, am I right? One of the things that I really like about this product is that it comes in an airless pump bottle. Now, I’m not the kind of person that worries too much about using my fingers to scoop product out of a jar, but I know some folks don’t like that at all. 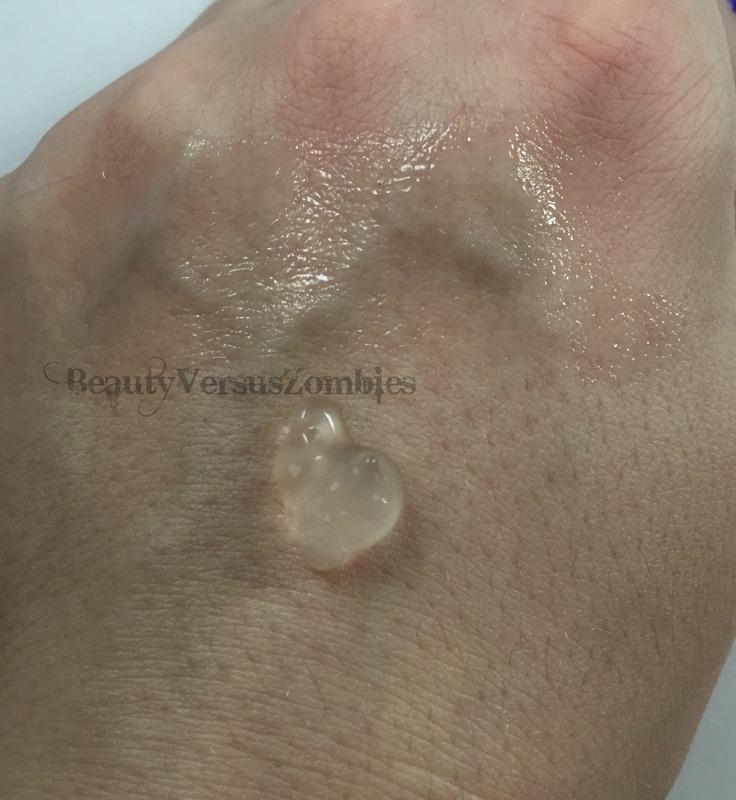 Plus, having an airless pump means that I don’t have to worry about half of my product becoming gross and unusable simply because I keep opening it and exposing it to the air. The bottle itself is a sturdy but not cheap-looking plastic. The nice thing about it being a little less than opaque is that you can see when you are starting to run low and then re-order before you run out. The First Ampoule Essence has the following ingredients: Saccharomyces ferment, butylene glycol, glycerin, niacinamide, water, 1, 2-hexanediol, dimethiconol, cyclomethicone, arctium lappa root extract, piper methysticum leaf/root/stem extract, phellinus linteus extract, sciadopitys verticillata root extract, portulaca oleracea extract, pueraria thunbergiana root extract, glycyrrhiza glabra (licorice) root extract, paeonia lactiflora root extract, cnidium officinale root extract, centella asiatica extract, linum usitatissimum (linseed) seed extract, aloe barbadensis leaf extract, hibiscus esculentis fruit extract, althaea officinalis leaf/root extract, ocimum basilicum (basil) flower/leaf extract, houttuynia cordata extract, anthemis nobilis flower extract, chamomilla recutita (matricaria) flower extract, foeniculum vulgare (fennel) leaf extract, rosmarinus officinalis (rosemary) leaf extract, calendula officinalis flower extract, PEG-40 hydrogenated castor oil, citrus aurantium dulcis (orange) fruit water, soluble collagen, aloe barbadensis leaf juice, hydrogenated lecithin, citrus grandis (grapefruit) peel oil, sodium hyaluronate, olea europaea(olive) fruit oil, argania spinosa kernel oil, citrus aurantifolia (lime) oil, ribes nigrum (black currant) seed oil, rose flower oil, illicium verum (anise) fruit/seed oil, carbomer, xanthan gum, sodium hydroxide, trisodium EDTA, agar, bisabolol, allantoin, algin, keratin amino acids, panthenol, mica, dicaprylyl carbonate, folic acid, ceramide 3, titanium dioxide, sucrose distearate, tocopherol, cholesterol, raffinose, tromethamine, palmitoyl pentapeptide-4, phenoxyethanol. So, other than the fact that there’s a whole crapload of natural extracts and ingredients in here, which I like, let’s talk about the big red flag: Algin. Like you might guess from the name similarities, algin is derived from a type of algae, and it’s used in cosmetics primarily as a binder, thickener, and fragrance ingredient. I wasn’t able to find any articles indicating that there is a safety risk when using algin, which makes sense since it’s listed on COSDNA as having a 1 safety risk. However, it is also ranked at a four out of five on both the acne and irritation scales. I never saw any acne or irritation from using this product, but if you have really sensitive skin you might want to keep that in mind. I didn’t wait for the product to absorb all the way into my skin before I took this picture, which is why you can still see the shiny area where I started blending. It’s got a pleasant, light scent to it that I can’t really put my finger on. The scent doesn’t linger at all. I actually really enjoy this product quite a bit. It’s not super moisturizing, which means that it’s good for all over my face. Oilier folks should be able to use this without causing an overload, and normal folks will be able to layer it like usual with other stuff. People with dry skin or who are using harsh prescription medications or heavy acids in their routines will definitely need something else on top of this. It simply isn’t enough to be super moisturizing by itself, although it’s not really designed to be so I can’t ding it for that. I do notice that my skin looks a lot fresher when I use at least one product in my routine that contains some fermented ingredient. I don’t suffer from super dull skin normally, but I definitely notice a brightening effect when I’m using this. Let’s put it this way – when I stop using ferments for a week or two, I can totally tell the difference. You can get the First Ampoule Essence for around $19 on RoseRoseShop or their eBay store, or for $27 on Amazon (seriously?). It is out of stock right now on the Nature Republic website. Buying from RRS means you’re spending about $0.47 USD per mL. Missha’s FTE costs $49 for 150mL, so around $0.32 per mL, which is cheaper. If you’re just looking for fermented brightening goodness, the Missha is a more budget-effective bet. But if the new Missha formula broke you out, or you want something with licorice and fermented ingredients, the First Ampoule Essence is a good product. Will I repurchase it? Well, I’ve got a lot of stuff to test on my plate, so probably not immediately… but I will use the entire bottle most likely. I like looking bright and fresh! 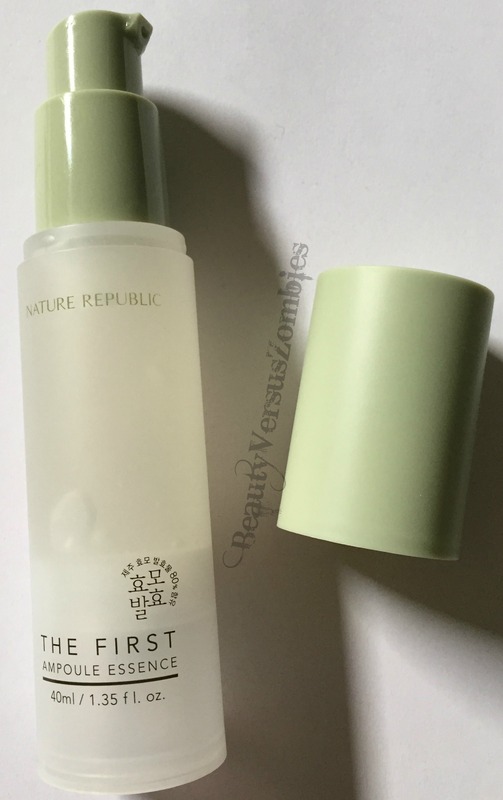 This entry was posted in k-beauty, Nature Republic, review, skincare and tagged review, skincare by BeautyVersusZombies. Bookmark the permalink. I stumbled upon your blog when looking for product alternatives for FTE that does contain licorice ( shame Missha and NR discontinued their earlier formulations). I was especially interested since you mentioned licorice extract as an ingredient in the new ampoule essence but Cosdna does not list the licorice. Would you be able to confirm this as it might help me decide? Thanks! My ingredients list came right off of the product box. I’m not sure where COSDNA got their list. I also have to say that it looks like this product has been discontinued, so I don’t think NR is making any more of it & what you can buy may end up being hard to replace later on. I’m sorry to be the bearer of bad news. Hope you find something great!